In part two of the Cambridge English: Advanced Speaking test, you are given a piece of paper with 3 photos on. The photos are almost always about people. You have to talk about 2 of the pictures, on your own, for a minute. Then the examiner will ask the other candidate a question about your pictures. Next, the other candidate will have to talk for a minute about some different pictures, and you will be asked a question about those pictures. The technique for answering this follow-up question is the same as Speaking Test Part One - respond in about 3 sentences and try to show off your vocabulary. You are asked to talk about TWO pictures. Choose two and say nothing about the third one. Weak candidates simply describe the pictures: "I can see a car. The car is red. There is a tree." You aren't asked to describe them. Strong candidates compare the pictures - that's explained more below. Dead air ... is still a crime! You get 60 seconds to do this task. Use all of it! When your time is up the examiner will stop you. The examiner tells you what to do, but the task is also printed on the page with the photos. Refer to that page to make sure you talk about both bullet points. While you are comparing the photos, try to look at the examiner and the other candidate from time to time. It's hard because you have to look at the pictures, but strong candidates don't talk to the photos - they talk about the photos. When the examiner gives you the instructions for the task, he or she will always start, 'I'd like you to compare two of the pictures and say...' Comparing is the heart of the task. If you aren't comparing, you aren't scoring points. "Both pictures show men using phones." "Whereas in this picture the man is wearing a suit, in this picture the man is dressed in some kind of traditional costume." "While the businessman is sending a text or checking his portfolio, the man in the fluffy hat is checking his voicemail." 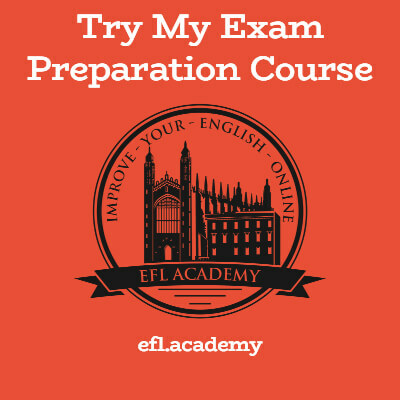 In most of the CAE speaking exam part 2 scenarios, the word 'might' will be in the instructions. 'Say why the people might be checking the time'. 'Say how safety might be important in this job.' That's because the examiners want to know if you can use speculative language. "Perhaps these men are retired and are spending their day feeding ducks by the lake. In contrast, the policeman has to wear a hat for his job. It could be that he hates wearing the hat, whereas the old men have probably chosen to wear theirs. Maybe it's a sunny day and they want to protect their heads from the sun, while the policeman's helmet might protect him from attackers." In the last example there was a lot of speculative language, but also a lot of comparing language. See how easy it is? Let's put it all together - A student called Heidi tries with a real example from Cambridge. Her answer: "They're both young students, girls, and both in a traditional school setting. This picture shows a student on her own, whereas this student is in her whole class. She has the support of a teacher, but this student doesn't have that. She has to learn to study on her own, and that's not bad. I think she might be studying for a test or - oh! Probably she's just doing her homework. Both are useful skills for her future. I'm sure she has a lot of tests and homework still ahead of her! While the first student is doing her homework for tomorrow, this one has already done her homework and now she's presenting it to the whole class. That's useful - she'll have to do presentations when she gets a job or give a speech when she gets married! What else? Well, it's beneficial for the second girl to practice this - but I think doing the research will have more benefit in the future, because you have to prepare before you can give a good presentation."